There are few food blogs which grabs your attention from very first visit. It could be the way it is designed (uncluttered and clean works for me), the narration, eye catching photography or the precise, clear instructions. Deesha’s Vegetable Platter is one such blog which has all these qualities and much more! Her authentic and traditional recipes married well with the modern and fusion style of cooking along with her crisp and beautiful food photography which is like a cherry on top of already delicious and beautiful cake! I am honoured to have her today as a guest blogger. Please welcome Deesha and don’t forget to follow her on Twitter. Monsoon Spice has been around for a long time. I remember, when I was taking baby steps in the world of blogging, I would wait for Sia's posts and ogle at those larger than life food pictures. I loved the way she wove stories around food and made it so heart warming. So, it goes without saying that I did derive a lot of inspiration from Monsoon Spice. And, to do a Guest Post for Monsoon Spice is an honour. Thanks Sia!!! Pasta is such a comfort food and I love the fact that it’s so easy to customize. 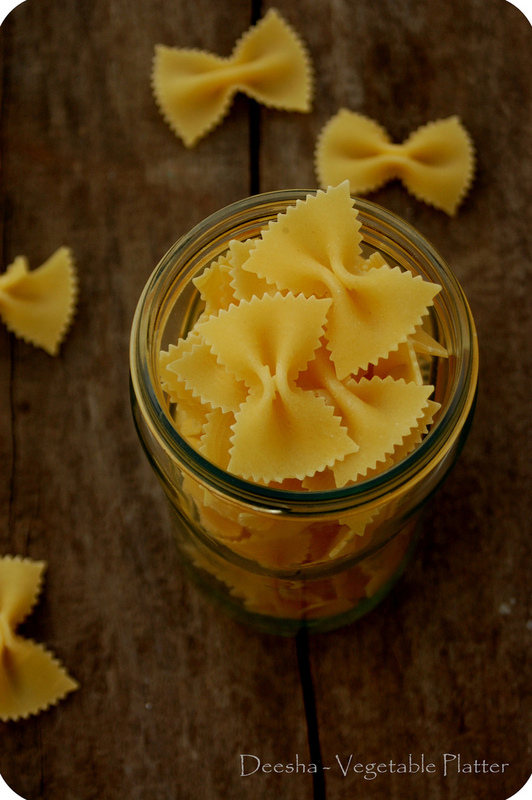 Its winter here, in our neck of woods, and a bowl of warm homemade Pasta is what I crave for dinner. I've made tons of variations in Pasta but Mushrooms is something that never got paired with it simply because I am not very fond of mushrooms.. So, instead of using whole mushrooms, I made a sauce with roasted mushrooms & it turned out so well, that I actually didn't mind mushrooms for the first time. Preheat the oven to 450F. In a bowl, add mushrooms, onion Oregano, some salt, olive oil and rosemary and toss to coat well. Arrange the mushrooms on a baking tray and let them bake in the oven for about 15-20 mins until the mushrooms turn slightly golden. Allow them to cool. 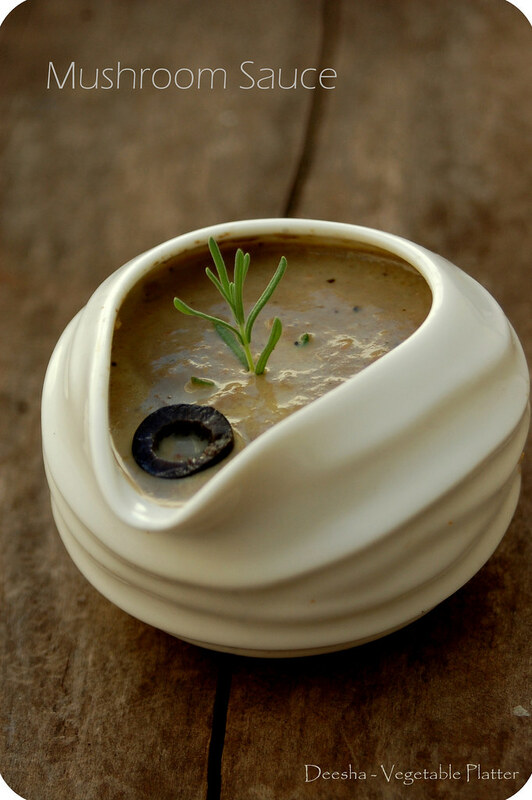 In a blender, blend the roasted mushrooms and onion into a smooth paste using little milk. Add Pasta and olives into the mushroom sauce and mix well to coat. Let it simmer on low heat for about 2 mins. Transfer to individual serving bowl and garnish with grated Parmesan and chopped parsley before serving. 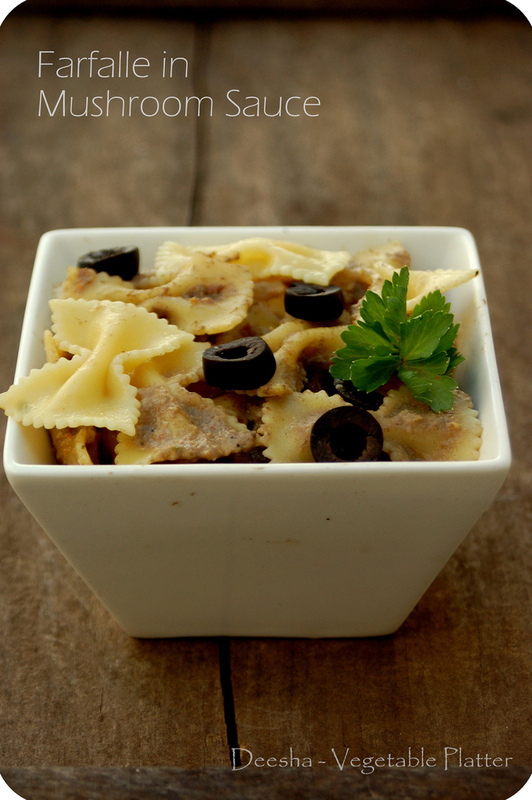 I love farfalle and mushrooms, so that delicious dish is for me! Love the post; those look lovely! Love the recipe and the pic that goes with it. I am a big fan of Vegetable Platter and love Deesha's photography! It's beautiful as usual! This is an absolutey lovely mushroom pasta dish. Thank You and Thank Deesha.